Free downloadable booklet offers unique insight into reasons a person in recovery can easily relapse if factors that lead to relapse are not fully addressed. We wanted families to understand that there are specific reasons for relapse. When they grasp this, they might comprehend why the Narconon program has been able to reduce or prevent relapse in the majority of people completing its program. The tragic truth is that most families who are trying to help an addicted person succeed in rehab have to go through this process more than once. According to the Substance Abuse and Mental Health Services Administration (SAMHSA), six out of every ten people who were admitted to treatment in 2010 were going to treatment a second, third, even a fifth (or more) time. Each time a person goes to rehab, it is difficult not only for the addicted person, but also for the whole family. There are hopes and fears connected with each admission, and heartbreak connected with a subsequent relapse. After a relapse, a family will once again lose sleep and fear the phone call that could tell them of an overdose, injury or arrest. "In our work with tens of thousands of families who are trying to save the life of a loved one, we’ve seen that too many people do not understand why relapse occurs," said Clark Carr, president of Narconon International. Narconon is a non-profit drug rehabilitation and prevention organization with more than 100 locations around the world. "We wanted families to understand that there are specific reasons for relapse. When they grasp this, they might comprehend why the Narconon program has been able to reduce or prevent relapse in the majority of people completing its program." The new publication, Factors of Relapse, uses guidelines from SAMHSA, the United Nations and the World Health Organization (WHO) to discuss the many personal abilities and life skills, destroyed by addiction that must be restored for a person to more successfully recover and stay sober for the long term after rehab. Every parent of an addicted person will recognize in this list abilities in their loved one that disappeared as addiction took hold. The Narconon report continues by providing a list of seven major factors of recovery that must be covered for a rehab program to be effective. Each of these seven factors and successful methods for addressing them developed by Narconon are described in simple, non-technical terms. "Families don’t need to struggle with relapse as a 'mystery' any longer," said Carr. "With a free download and a short study of this booklet, families should feel better educated on the subject and more empowered to deal with their loved one's recovery." 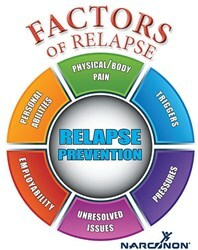 The free booklet Factors of Relapse can be downloaded at http://www.narconon.org/drug-rehab/relapse-factors/. 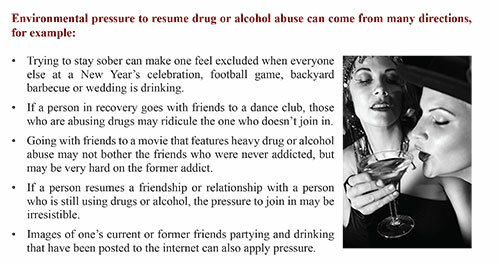 For more information on the Narconon drug rehabilitation program, call 1-800-775-8750.